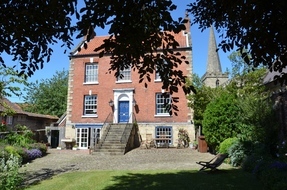 Location, comfort and history - The Old Vicarage Guest House is the perfect choice for your bed and breakfast experience. This Grade ll listed, late Georgian Vicarage is well appointed with an Arts & Crafts leaning in décor, and set in a tranquil walled garden. We are just a short stroll from Pickering’s Market Place with private parking. We have three en-suite bedrooms: one with a king-size bed and two rooms with double beds. All have Smart TVs and Wi-Fi. We also offer complementary Wolds Way Lavender Toiletries. You are welcome to relax in the guest lounge, where there are two large comfortable sofas and a TV. Start the day with a delicious breakfast cooked to your requirements and served at a time to suit you. Choose from a comprehensive breakfast menu, a traditional cooked breakfast or something lighter, if you wish. As far as possible we use fresh locally sourced products, and we are happy to cater for any special dietary requirements - just let us know your needs. Regarding children: We don't have a family room as such, however Room One can accommodate your own travel cot and for the older child we can provide a camp bed. Please note that access to all our guest areas involves stairs.